In Part One of this post, we identified two players among the top five best golf swings in the present day – Rory McIlroy and Tiger Woods. In this post, we deal with the remaining three. It should be no surprise that the players on this list are also among the most-accomplished over the last couple decades. With golf swings like these, good results are sure to follow. Freddy is one of the most-popular golfers of all-time, beloved for his laid back attitude and golf swing to match. Rather than creating power with an aggressive, muscular action like so many modern players, Fred takes a more-fluid approach. Watching Couples swing the club is something close to poetry-in-motion, as he makes hitting 300 yard drives look completely effortless. Along with Fred Couples, Ernie Els is another one of the most-popular golfers in the world, and he too has a laid back style and swing. Appropriately nicknamed ‘The Big Easy’, Els is able to use his large frame to produce impressive power without the appearance of a lot of effort. The mechanics of Els’ swing are a little more traditional than the looping swing of Couples, yet the smooth tempos are strikingly similar. Perhaps not surprisingly, Els, again like Couples, is aging gracefully on the golf course. Well into his 40’s, Els remains highly competitive having won The Open Championship as recently as 2012. Ernie keeps the club extended nicely during his backswing and is able to use that wide arc to accumulate speed down into the impact position. The result is powerful, efficient, consistent, and among the best swings in the world. Having finally gotten the major championship ‘monkey’ off his back, Adam Scott can finally be recognized for what he is – one of the best golfers in the world. As far as golf swings go, it might not get any better than the one Scott brings with him week after week. Technically, many consider it is as close to perfection as it gets. Add in Scott’s impressive build and level of fitness, and the results are truly spectacular. Unlike Els and Couples, there is a little more obvious effort during Scott’s swing. He represents everything that we now expect in a modern swing – big shoulder turn, solid base, wide arc, and aggressive acceleration. Scott certainly has plenty of distance both off the tee and with his irons, but he also controls the ball beautifully. So, which of these five best great swings should you copy for your own game? Well, probably none of them. Rather, you should learn things from all of them and apply them in a way that makes sense for the swing you already have. By watching any of these five swings, you should be able to learn things about the golf swing that you might not have known previously. Think then about what parts of their swings could help you, and try to integrate those elements into your practice sessions. You won’t end up with a swing that looks like one of these professionals, but you will hopefully find more power and consistency in your ball striking as a result. There are many reasons to watch golf on TV. For one, it can provide incredible drama. The excitement of the last few holes of a golf tournament when all the pressure starts to be felt by the players in the lead is unlike anything in sports. Just the drama alone is enough to make non-golfers watch from the edge of their seats. Beyond that excitement, there are many other elements to watching pro golf that make it compelling. For avid golfers, watching the swings of the professionals is one of the most interesting parts. We all have our own golf swings, so it is fun to compare how we swing the club to the swings of the best players on the planet. While we are usually far short of the power and accuracy the pros can accomplish, we can at least copy portions that we like and develop our swings to be a little closer to the best golf swings. This article (and Part Two) will look at five of the best golf swings in the modern game. Each swing is a little bit different, yet they all share some common elements which allow them to be used so effectively. Read on to see if your favorite swing has made our top-five list. It should be no surprise that the swing of one of the best young players on tour lands on our list. McIlory does just about everything right on the course, and that includes making a beautiful and powerful swing. Over the last year or so, McIlroy has improved even further on the swing that has already netted him two major titles. Where the top of his swing used to have a little bit of a loop, it is now a much more-direct path from top of backswing down to impact. One of the most impressive things about Rory’s swing is the power he can generate from his smaller-than-average frame (by tour standards). Rory is in excellent physical condition, but stands just 5’9’’ tall. Most long hitters are taller than six feet, but Rory is able to make up for his lack of height with considerable speed. Despite giving up a few inches of height to many of his competitors, McIlroy is able to bomb it out there with all but the very longest hitters. That power is a testament to not only his body, but also the quality of his swing itself. Quite possibly the best golfer to ever play the game, the history of Tiger Woods swing is an interesting one. While he has played phenomenal golf throughout his professional career, it hasn’t always been with the same swing. He has gone through a couple transformations during his time on tour, whether in response to a desire for added consistency or to compensate for past injuries. Either way, Tiger always seems to morph his old swing into a new one as effectively as anyone in the history of the game. Please see Part Two of this post for a look at the other three of our top five modern-day golf swings. Be sure to check out The Golf Channel’s article called Going DEEP! 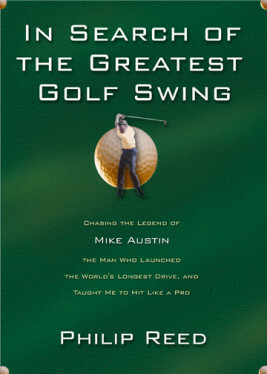 regarding Guinness World Record Long Driver Mike Austin and Phil Reed’s book about Mike called “In Search of the Greatest Golf Swing”.